the process of getting some art back on the reservoir was successful. 1) The Board will go out to the community and key stakeholders to develop an agreed approach. This will be an open process to gather in ideas and come to a community consensus. 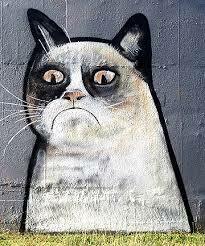 The result could be that people just want Grumpy Cat back, or it could be something different. 2) The Board will then take that proposal to Watercare for consideration and implementation. This is an issue that has really been driven along by the community and we have been very happy to support it. Let's keep working together to get a result we can all feel happy, rather than grumpy about.